A Life of Sugar and Spice: FINALLY!!!!!!!! How many posts have I written about my morning oatmeal that I miss so much? 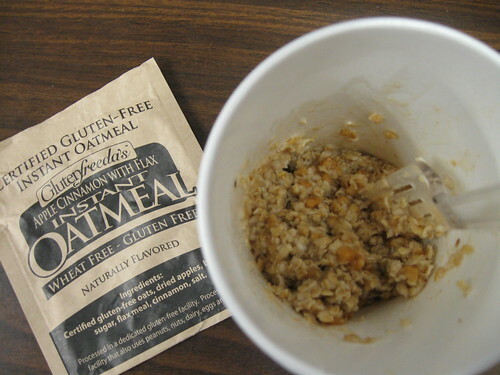 Well, thanks to Glutenfreeda I will no longer have to try to find alternatives for that yummy hot breakfast that I love. I went to Good Health in Quincy Center last night to pick up some Quinoa flakes so that I could make these delicious muffins that I saw on Our Gluten Free Family and what did I see sitting right next to the flakes? The people in the store must've been laughing at me as I practically shrieked outloud "Seriously?!" They had three varieties, plus a variety pack so I grabbed the variety pack so I can try all three! Maple Raisin with Flax, Banana Maple with Flax, and Apple Cinnamon with Flax. Today I tried the apple cinnamon. It's pretty good! A little bland (compared to sugar loaded Quaker Oats) and I didn't put enough water in it, but it's definitely something I would buy regularly. This one little packet has 4g of Fiber and 5g of Protein. Very cool. It's just recently launched, and I've had difficulty finding it online, but there are a few places it can be ordered. I also couldn't find it on Glutenfreeda's website, although they did twitter about it in February. Here is one link to a webstore for ordering. I also have tried this week: Bakery on Main Granola Bars, Enjoy Life Double Chocolate Brownie Cookies, and some gross crackers, I forget what brand. But I'll blog about it all throughout the rest of the week! I read about these somewhere. Very happy for you that you have a new regular grab-and-go breakfast item to keep in your arsenal. I definitely can't tolerate oats, but to those who can, I say CHEERS! Ugh, totally spent half of the day at the hospital today having a gastric emptying test. Lovely. oh my gosh, oh my gosh! I'd love to find those. I've eaten Bob's GF oats, but they don't really have a great texture... sometimes you get bits of something hard, like the outside of the oat. It's wierd and sours the oatmeal experience.